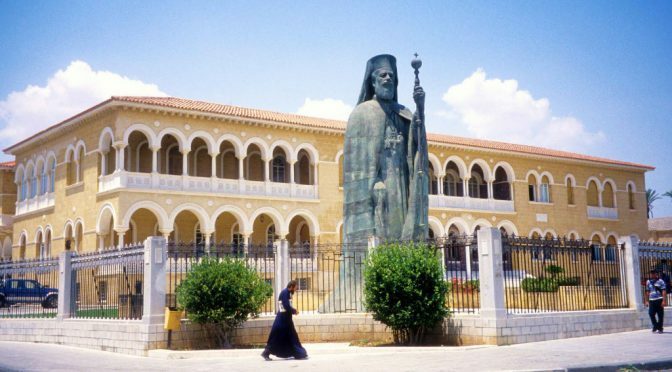 Nicosia is a town in the center of the Mediterranean island of Cyprus and the capital of the eponymous district. Nicosia is the capital of the Republic of Cyprus, the northern part of the capital also Turkish Republic of Northern Cyprus. Nicosia has 276,410 (agglomeration 476,000) inhabitants, of whom 220,907 people in the (Greek Cypriot) south of the city and 55,503 people in the (Turkish Cypriot) northern part of life (2012). Nicosia is located approximately in the middle of the island and many roads leading from there to the star-shaped coastal cities. The A1 connects Nicosia with the Südküstenautobahn, the A9 leads west to the Troodos Mountains. The urban society OSEL operates urban bus services, there are still regional Nicosia bus. In the northern part of town is the Ercan Airport, this is accessed via a 4-lane highway, the southern part of the Larnaca airport used. The old airport of Nicosia since 1974 has been blocked because it is in the UN protected zone. The city is part of international law in its entirety to the Republic of Cyprus, but since the invasion of the Turkish armed forces in July 1974 and the proclamation of the – of the international community – unrecognized Turkish Republic of Northern Cyprus in November 1983 in fact does not exercise sovereignty over the northern part of Nicosia. Since then the town by a “Green Line” (“Green Line” / “πράσινη γραμμή” / “Yesil has”) divided by the peacekeeping forces of the United Nations, the United Nations Peacekeeping Force in Cyprus (UNFICYP) is monitored. In the countryside you’ll encounter olive groves and various orchards leading up in to the renowned pine forest of the Machairas Mountains on top of which lies a centuries old monastery. From the monastery which is dedicated to the Virgin Mary and is one of the jewels of Cyprus, you can look down on to the picturesque valley with a brilliant view in all directions. Traditional villages with cobbled streets are spread throughout the rural areas of the Nicosia district. The village of Fikardou, declared a national monument, was awarded the Europa Nostra award in 1987 and is a must-see if you are in the vicinity and want a strong taste of the Cyprus rural life. Looking for all of the information that is important for living and working in Nicosia can take you hours. However, by using Melkava services you can greatly simplify your relocation to Nicosia. Beginning with local infrastructure top tips about food & shopping – the guide deals with all the different facets of the life in Nicosia.